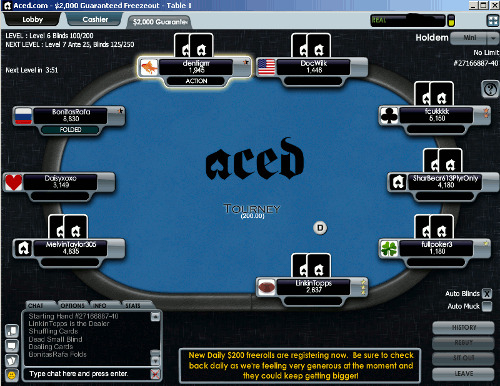 Welcome to our complete review of Aced.com; a popular online poker room that is part of the Merge Poker Network. Aced Poker accepts players from around the world, including USA players, and they are currently giving away a fantastic 150% bonus worth up to $750 in free poker money to all new players! Aced Poker is an established and respected online poker room that we never hesitate to recommend to any of our website visitors. They accept virtually all players, including all USA players, so this is the perfect place for everyone to play online poker! Aced Poker is a proud member of the Merge Poker Network and they are home to some of the largest online poker tournaments. 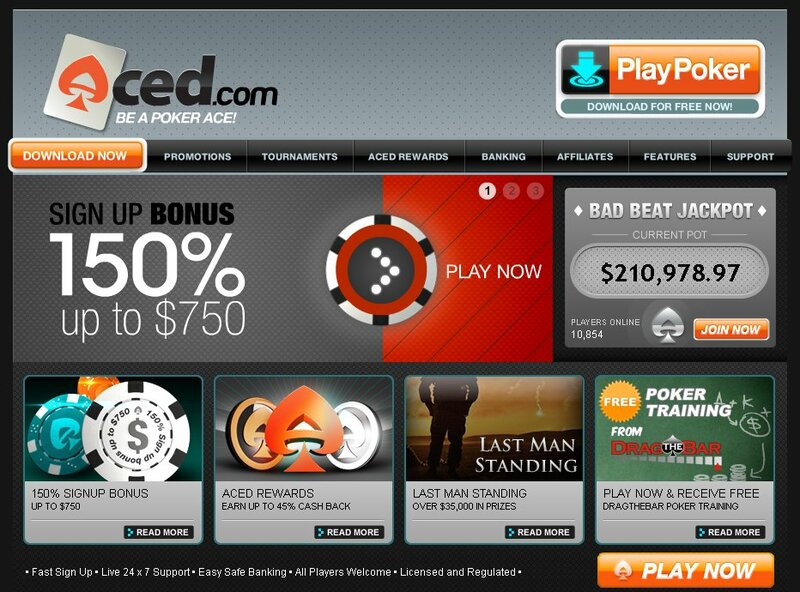 If you�ve been searching for a new online poker room that you haven�t tried before, you can�t go wrong with Aced Poker! Important: Use Aced Poker Coupon Code "ACED" for the maximum $750 bonus offer. At the moment, all new players who signup and make their first deposit at Aced Poker will be eligible to receive a fantastic 150% match bonus worth up to $750 in free poker money. This is one of the biggest online poker bonuses that we�ve come across, so we encourage you to take advantage of it today while supplies last! The great thing about this poker bonus is that it allows you to extend your playing time, which ultimately increases your chances of winning! One reason why we really like Aced Poker is because they have a fantastic variety of competition available around the clock. Depending on your game preference, you can capitalize on the variety of competition that they have by selecting the games and limits where you�ve been most successful. At Aced Poker, you can clean up against the fish or test yourself against the sharks! As we alluded to above, Aced Poker offers a wide variety of online poker games, which is why they are home to such a wide variety of competition. At the moment, they are currently offering Texas Holdem, Omaha, Omaha Hi Lo, Stud, Stud Hi Lo , 5 Card Draw along with Razz, HORSE, and 2-7 Triple Lowball. Each of these games is available to be played in the No Limit, Pot Limit, and Fixed Limit varieties. They can also be played for as little as $0.02/$0.04 all the way up to $50/$100, so there are plenty of options available regardless of your budget! There are thousands of players participating in their cash games around the clock, so we�re confident that you won�t have any trouble finding a game that interests you! If you�re more interested in playing online poker tournaments than cash games, we�re thrilled to inform you that Aced Poker has one of the best selections of online poker tournaments to choose from! They have hundreds of tournaments available on a daily basis, including Sit N� Go tournaments and Multi-Table Tournaments, which are available in wide range of limits. Aced Poker features satellite tournaments, shootout tournaments, and guaranteed tournaments just to name a few! In total, they have more than $4,000,000 in guaranteed tournaments each month, so there is plenty of money up for grabs each and every day! Their biggest online poker tournament is played each Sunday and offers a $50,000 guaranteed prize pool! You can buy-in directly or you can win a seat in one of their satellite tournaments, so there are plenty of different way to get in! As a proud member of the Merge Poker Network, Aced Poker is currently home to some of the most advanced poker software in the online gaming industry. Their cutting edge software will impress you in virtually all areas and once you experience it for yourself, you�ll have a hard time playing anywhere else! Aced Poker features amazing graphics and superior sound that help enhance your experience each and every time you�re at the tables. Another great feature of Aced Poker�s software is that they allow you to create a buddy list, which allows you to see when your friends are online. You can even take notes (on your friends and your competitors), which you can then use to improve your strategy and increase your chances of winning each hand! The best thing about Aced Poker is that their software is extremely easy to navigate. It�s very easy to make your initial deposit and claim your free bonus and it�s just as easy to make a withdrawal! Finding your favorite games is also easy because everything is just a single click away. You can even customize their software based on a wide variety of criteria, which will help you find your way around even faster on each subsequent visit! So if you�ve been looking for a reputable online poker room that makes playing online poker easy, Aced Poker is definitely the place for you! Right now, you can make your first deposit at Aced Poker using credit cards, Neteller, Click2Pay, 1Pay, Moneybookers, EcoCard, InstaDebit, ClickandBuy, Entropay, PaySafeCard, and WebMoney. Should you run into any trouble making a deposit, they have support staff available 24/7 to assist you! Without a doubt Aced Poker is one of our favorite online poker rooms and we�re confident that you�ll enjoy playing here on a regular basis!